Activists said outrage over Arizona's controversial immigration law "awakened a sleeping giant" Saturday as rallies demanding federal immigration reform kicked off in cities across the country. In New York, labor organizer John Delgado said anger over the law - which requires local law enforcement to question people about their immigration status if there is reason to suspect they're in the country illegally - drew more than 5,000 people to a rally at Manhattan's Foley Square. "She's awakened a sleeping giant," Delgado said, referring to Arizona Gov. Jan Brewer, who signed the law. In Los Angeles, singer Gloria Estefan kicked off a massive downtown march to demand immigration reform and protest the Arizona law. Estefan spoke in Spanish and English atop a flatbed truck, proclaiming the United States is a nation of immigrants. She said immigrants are good, hardworking people, not criminals. Cardinal Roger Mahony stood on the truck chanting in Spanish, "Si, se puede," or "Yes we can." Organizers believe opposition to the law could be the catalyst to draw tens of thousands to rallies in dozens of cities. Four years ago, more than a million people across the country united to protest ultimately unsuccessful federal legislation that would have made being an illegal immigrant a felony. The movement fractured and annual May 1 rally attendance dropped sharply as attempts to reform federal immigration policy fizzled. In 2006, nearly half a million people took to Chicago's streets. Last year, fewer than 15,000 participated in the rallies, held May 1 because it's a traditional day of protest and International Workers Day. But immigration reform advocates have seen a flurry of activity since Brewer signed the Arizona measure into law last week. "What happened in Arizona proves that racism and anti-immigrant hysteria across the country still exists. We need to continue to fight," said Lee Siu Hin, a coordinator with the Washington, D.C.-based National Immigrant Solidarity Network. Activists are mobilizing through online social networking, churches and ethnic media. They have called for a boycott of Arizona businesses and protested outside Arizona Diamondbacks baseball games. "What we have to do," he told anchor Chriss Wragge, "is bring everyone together on solving the border security crisis in this country, solving the illegal immigration crisis in this country. … We have to solve the problem. We've got to stop the nonsense." Supporters say the controversial new immigration law is necessary for one reason: safety.
. When he radioed in, he said his assailant was an illegal immigrant. Many here attribute a rising crime rate to the rising tide of illegal immigrants. When Governor Jan Brewer signed the country's toughest anti-illegal immigration legislation into law, it ignited a firestorm. As one of its last acts before adjourning, the Arizona legislature amended the controversial law, strengthening restrictions against racial profiling, while giving police more latitude to stop suspects and demand proof of citizenship, reports CBS News correspondent Bill Whittaker. Three lawsuits seeking to overturn it have been filed already; more are on the way. And protesters plan to keep up the pressure. "I'm an American citizen," said Abel Garcia. "I shouldn't have to be harassed to prove I'm an American citizen." Activists believe opposition to the law - which requires authorities to question people about immigration status if there is reason to suspect they're in the country illegally - could be the catalyst to draw crowds similar to those four years ago. That's when more than a million people across the country united to protest ultimately unsuccessful federal legislation that would have made being an illegal immigrant a felony. The movement fractured, and annual May 1 rally attendance dropped sharply as attempts to reform federal immigration policy fizzled. In 2006, nearly half a million people took to Chicago's streets. Last year, fewer than 15,000 participated in the rallies, held May 1 because it's a traditional day of protest and International Workers Day. But immigration reform advocates have seen a flurry of activity since the Arizona measure was signed into law last week. Relying on online social networking, churches and ethnic media to mobilize, activists have called for a boycott of Arizona businesses and protested outside Arizona Diamondbacks baseball games. Supporters say the law is necessary because of the federal government's failure to secure the border and growing anxiety over crime related to illegal immigration, while critics say it's unconstitutional and encourages racial profiling and discrimination against immigrants or anyone thought to be an immigrant. Activists fear without federal legislation in place to address the estimated 12 million illegal immigrants living in the U.S., other states will follow Arizona's lead. "If Republicans and Democrats do not take care of this albatross around our necks, this will in fact be the undoing of many, many years of civil rights struggle in this country," said Jorge-Mario Cabrera, a spokesman for the Coalition for Humane Immigrant Rights of Los Angeles, where organizers expect 100,000 to march downtown Saturday. President Barack Obama had once promised to tackle immigration reform in his first 100 days, but has pushed back that timetable several times. He said this week that Congress may lack the "appetite" to take on immigration after going through a tough legislative year. However, the president and Congress could address related issues, like boosting personnel and resources for border security, in spending bills this year. Activists aren't alone in their opposition to Arizona's law, a fact May 1 organizers hope will draw out even more people Saturday. California legislators have mulled canceling contracts with Arizona in protest. Denver Public Schools has banned work-related travel to Arizona. And several legal challenges, preventing the bill from going into effect this summer, are in the works. Immigrant rights activists and politicians also say they're stepping up other forms of action. U.S. Rep. Luis Gutierrez, a Chicago Democrat who has sponsored a House immigration bill, said he plans to participate in civil disobedience at the White House on Saturday. In Chicago, several college students plan to publicly "come out" as illegal immigrants on a downtown stage. "It's time to come together and show that undocumenteds have dignity. They're human," said Douglas Interiano, a spokesman of Reform Immigration for Texas Alliance, which is helping plan Saturday's march in Dallas. He projected up to 100,000 could march in Texas with similar events planned in El Paso, Houston, Austin and San Juan. "Given what's happening in Arizona now it's crucial for us to speak out and denounce what's happening," said Veronica Mendez, an organizer with the Workers Interfaith Network in Minneapolis, where there's also a Saturday rally. "We all have the same hopes and goals." 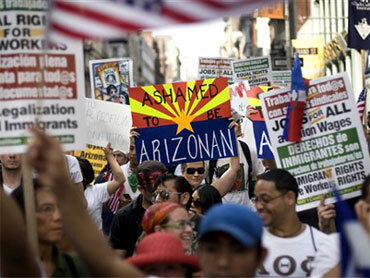 Dobbs: Protests Against Ariz. Law Just "Theater"
Can Dems Do Immigration Reform this Year? In Ann Arbor, Mich., more than 500 people held a mock graduation ceremony for undocumented immigrant students near the site of Mr. Obama's University of Michigan commencement speech. "It's time to come together and show that undocumenteds have dignity. They're human," said Douglas Interiano, a spokesman for Reform Immigration for Texas Alliance, which is helping plan Saturday's march in Dallas. He projected up to 100,000 could march in Dallas, with similar events planned in El Paso, Houston, Austin and San Juan. About a dozen people at the Dallas event carried signs depicting Brewer as a Nazi and Maricopa County Sheriff Joe Arpaio, known for his tough illegal immigration stance, as a Klansman. Organizers were asking sign holders to discard the placards. "Given what's happening in Arizona now it's crucial for us to speak out and denounce what's happening," said Veronica Mendez, a Workers Interfaith Network organizer in Minneapolis, where there's also a Saturday rally. "We all have the same hopes and goals." Immigrant rights organizer Salvador Reza of the group Puente said people from across Arizona - including immigrants and nonimmigrants - plan to stand up against the recent passage of the law, which requires authorities to question people about immigration status if there is reason to suspect they're in the country illegally. Political action and immigrant rights groups, college students, laborers and others are expected to gather at the Capitol. Reza said he expects several thousand people. "There's going to be people all day long," with young people rallying at the Capitol Saturday morning, some coming in from California, Reza said. As part of the rally at the Capitol, a town hall meeting is planned to gauge what people want and how they want their politicians to handle the new immigration enforcement law. Paul Teittelbaum, an organizer with the Tucson May 1st Coalition, told The Associated Press the march and rally will focus on the new law. "This year does have special significance here in Arizona because of the racist, anti-immigrant bill," Teittelbaum said. "What we demand is the repeal of (the law). And what we demand is the end of the militarization of the border and the criminalization of immigrant workers," he said. Rally organizers in Phoenix said they want President Barack Obama to intervene in Arizona and issue an executive order asserting the federal government's exclusive control over immigration laws.